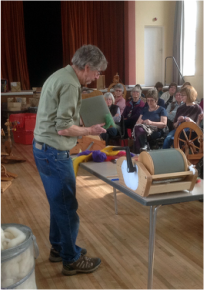 Janet Philips, accompanied by a treasure trove of shop items and hand-dyed fibres, visited the Guild to demonstrate various ways to blend fibres for spinning art yarn. She produced wonderful batts; layered, striped and some with short lengths of yarn blended in for texture. Janet was very generous with her expertise, answering numerous questions that cropped up during and after her demonstration: a lucky few would be joining Janet the next day for an art yarn workshop but all of us were left with our minds buzzing with ideas for creating our own blends specifically for spinning art yarns. 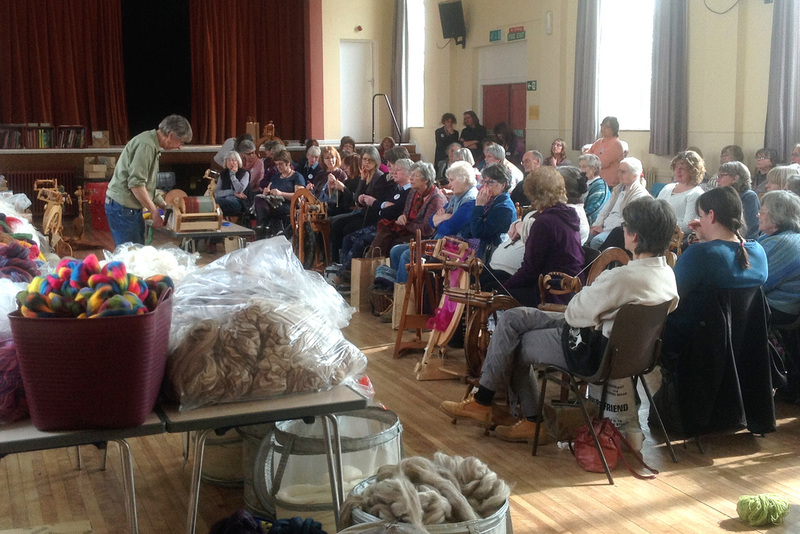 The Guild welcomed Martin and Pauline Reeves of P&M Woolcraft to America Hall in March. 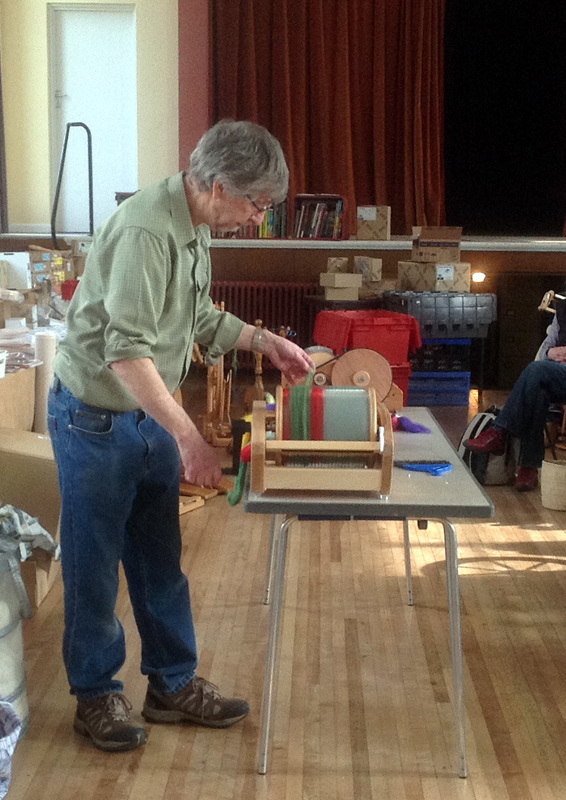 Martin gave members an overview of the use of various drum carders and a blending board. Pauline usually demonstrates as Paul talks but as she was having problems with her thumbs Martin bravely (and unusually for the male of the species!) multi-tasked. They also brought an astonishing amount of fibre and equipment to sell (it is clear that their van is the modern/motorised version of Mary Poppins' carpet bag!) and there seemed to be a constant queue of people at the cash till. Jill Denton is a talented textile artist, author and tutor. 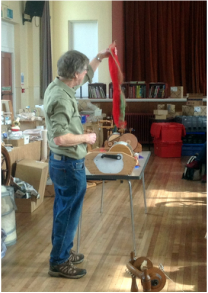 In her talk to our Guild she described how she explored a wide variety of art and crafts before discovering felting and she brought stunning pieces of work along to illustrate how her work developed (and continues to develop) and where her inspiration comes from. Sara Millis of Sara's Texture Crafts gave a short but very interesting talk on how her enthusiasm for fibre and colour grew from her past career in the fashion industry. 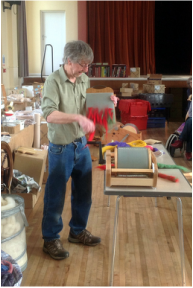 She then demonstrated some of the different effects you can get by blending wool and silk with hand carders, a blending board and a drum carder. Each Guild member was then given small samples of brown Blue Faced Leicester and silk noil and set loose to play whilst Sara answered further questions on the hoof. 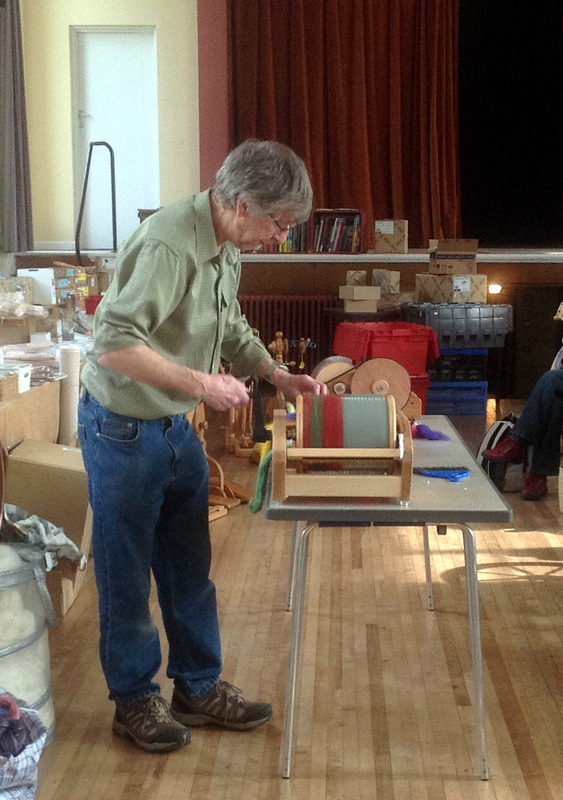 Helen Brotherton of My Fine Weaving Yarn talked about the surprisingly extensive capabilities of a rigid heddle loom. Helen brought many wonderful samples which clearly illustrated the wide variety of texture and pattern achievable on this often under-rated loom. Priscilla Lowry, Medievalist & Silk Historian, author, lecturer and designer, visited the Devon Guild as part of her 2014 UK lecture tour. Priscilla gave a fascinating talk on the manufacture and use of silk throughout the ages and brought many articles of clothing which she had designed and made.